Rent Excitement all year Long! Stay and Play in every season on Georgian Bay with anything you have ever wanted. Make your wildest dreams come true right here in Ontario! Welcome to Ontario's premier stay and play destination ~ PlaynStay.ca. We would like to invite you to come and experience what the ultimate cottage life is all about. PlaynStay.ca is a Rental package that puts together any outdoor activity that you can do on the water, with a luxury escape situated on Georgian Bay. Find out why people flock to "cottage country" and never want to leave. The reality of owning prime waterfront in Muskoka or Georgian Bay is out of reach for most of us and the ability to make enough time to enjoy your own cottage is usually even harder. So why not rent for a few days or a week and and scratch a few items off the bucket list at a fraction of what it costs to own. Diverse Rentals is Ontario's premier rental company offering hourly daily and weekly Sea-Doo and Waverunner rentals, 17' Bowrider and Pontoon Boat rentals. 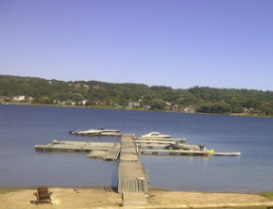 Kayak, Paddle-boat and Water Toy rentals including Tubes, Wake-Boards, and Water Skis. 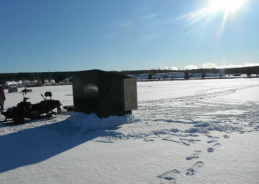 Ski-Doo rentals and Ice huts are available in the Winter and equipment as well. 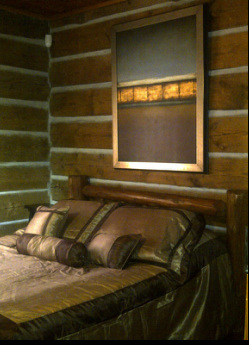 A luxury log cabin situated just minutes from the town of Penetanguishene by car or boat has all the amenities that you could want in a rental. Privacy, modern upgrades and access to the Great Lakes. 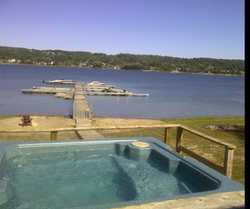 Romantic getaway, Boys trips, Girls Getaways, nature escapes...This Cottage rental has it all! Single seat and two up model snowmobiles all come with electric start and reverse...just in case you get into a little trouble, you can get back out of it safely! The Georgian Bay Cottage Rental has a Private outdoor hot tub, a beautiful stone gas fireplace, a private deck with heaters, an indoor and an indoor/outdoor audio entertainment system. Have an ice hut right outside your cabin and go straight out to it first thing in the morning. spend a few hours, go and enjoy other activities all day then make your way back down to the Ice hut before the day is out with heat and all your minnows right there! Capture your play. 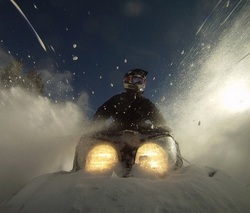 Camera mounts right on the waverunner or right on your snowmobile helmet. A brilliant and simple way to capture images of your outdoor exploits. The VX 110 is our standard rental unit. It is one of Yamaha's best all around watercraft that is easy to maneuver and has lots of space and comfort for you an your passengers. or upgrade to the Massive 4 seater SUV! This pioneer log cabin style private cottage rental Georgian Bay has an open kitchen, dining area, living room with 60 inch plasma TV a massive stone, gas fireplace and two pull out sectional couches for all of your family and friends. Grab a cooler, pack a luch and make your way to any one of our Island parks and make a day on the beach. Once you get up the lakes, you will never want to leave. You'll find no end to places to sit and relax with a 1000 square foot deck. Sit in the sun sun or shade, listen to music or fish off the bank. Herons, trumpeter swans and beavers are among the harbor visitors. In the event of a cold night we also provide two propane deck heaters at this Georgian Bay waterfront cottage rental. Take the whole family and a few friends on a pontoon boat fishing or up to the 30,000 islands and experience the Canadian Shield and all it's beauty. Here is the most useful dock at a rental cottage in Ontario. Holds up to a dozen boats up to 30' in length. Swim off the docks, fish off the docks or just pull up a chair and enjoy being on the water and the beautiful view.